Chris Jackson has nailed it with this article. Who is Michael Voris to complain about the Pope not slapping down the SSPX like in the good old 90's? First, the well-known position of Michael Voris and Church Militant TV is absolute and complete submission to the Holy Roman Pontiff to the point of not uttering one syllable of criticism against him. No doubt Mr. Voris believes strongly that Christ gave Peter the keys to bind and loose and not Michael Voris. 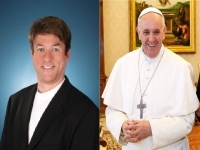 Therefore, by Mr. Voris’ own logic, it is the Pope’s role and responsibility to protect his flock by condemning error and making judgments as to which groups or persons are in “good standing” in the Church and not the role of Michael Voris. Yet, Mr. Voris publicly refuses submission to the Holy Roman Pontiff and Vicar of Christ on this issue by privately judging for himself and then publicly teaching as fact whether certain Catholics are “dissidents” and “schismatics.” He even takes it upon himself to publicly judge the visions of Medjugorje to be “bogus” when as recently as June 26th, the Pope himself, and the Vatican made crystal clear that no decision had been made on the validity of the apparitions there.Thus, Mr. Voris is apparently one of the “teachers of the Faith” he describes as feeling he is allowed to teach his own personal opinions as binding. …place themselves under the authority of the Vicar of Christ, rejecting his dogmatically defined “full power of shepherding, ruling and governing the universal Church,” a power "ordinary and immediate over all the churches and over each and every member of the faithful"
Yet, Mr, Voris himself, above and beyond rejecting the Vicar of Christ’s full and immediate jurisdictional power over these matters, actually usurps the Pope’s powers and uses them to publicly teach other Catholics who are “schismatics”, who are “dissidents”, and even whether Marian apparitions are “bogus”! Thus Mr. Voris has apparently set up his own counter-Magisterium which decides disciplinary matters for the faithful; disciplinary matters that are under the direct cognizance of the Vicar of Christ. Isn’t this the very definition of schism according to Voris himself? … things that should have long since been slapped down are allowed to just hang around and fester and create confusion and more confusion added to even more confusion. …Back in the day, Rome was much more decisive, and with that decisiveness came clarity. No one was unclear once Rome had spoken. There was even the expression that "Rome has spoken, the case is closed." …But in the Church, a tribunal was no longer acceptable; we could no longer judge or condemn. The modernists, like the Protestants, have singled out from the gospels their favorite phrase “Thou shalt not judge.” But they ignore the fact that immediately after, Our Lord said: “Beware of false prophets... by their fruits you shall know them.” A Catholic must not make ill-considered judgments on the faults and personal actions of his brethren, but Christ has commanded him to preserve his faith, and how can he do this without casting a critical eye upon what he is given to read or to hear? Any dubious opinion could be submitted to the magisterium; that was the purpose of the Holy Office. But since the reform, the Holy Office has defined itself as “the Office for Theological Research.” A considerable difference. I remember asking Cardinal Browne, former Superior General of the Dominicans, who had long been at the Holy Office, “Your Eminence, do you have the impression that this is a radical change, or merely superficial and outward?” “Oh no,” he replied, “the change is fundamental”. This is why we must not be surprised if little or nothing is condemned, if the Tribunal for the Faith of the Church no longer fulfills its duty toward theologians and all those who write on religious topics. It follows from this that errors are everywhere. They spread from the university chairs to the catechisms and to the remotest parish presbyteries. The poison of heresy ends by contaminating the whole Church. The ecclesiastical magisterium is in a very serious crisis. I have many times told the story of the birth of Ecône. In this house situated in the Valais in Switzerland, between Sion and Martigny, it was originally intended that the future priests would complete only their first year (of spirituality). Then they would follow the university course at Fribourg. A complete seminary (at Ecône) took shape as soon as it did because the University at Fribourg could not provide a truly Catholic education. The Church has always considered the university chairs of theology, canon law, liturgy and Church law as organs of her magisterium or at least of her preaching. Now it is quite certain that at present in all, or nearly all of the Catholic universities, the orthodox Catholic faith is no longer being taught. I have not found one doing so, either in free Europe, or in the United States, or in South America. There are always some professors who, under the pretext of theological research, express opinions which are contradictory to our faith, and not only on points of secondary importance. …The young students who hear these things from their professors and moreover from the dean of the faculty, and young seminarians who attend the classes, are little by little infected with the error. They receive a training which is no longer Catholic. It is the same for those who not long ago heard a Dominican professor at Fribourg assuring them that premarital relations are both normal and desirable. The above situation is the very definition of a “state of necessity” foreseen in the Church’s canon law. In such a state of widespread confusion, apostasy, and error due to what Dietrich Von Hildebrand called “the lethargy of the guardians” the faithful, priests, and bishops are allowed to take emergency measures to preserve the very purpose of the papacy, Catholicism, and canon law itself: the Faith. No pope has any right or authority to neglect his most basic duty as shepherd, the preservation of his flock, and then forbid and penalize the flock for trying to preserve itself. Yet Michael Voris condemns Archbishop Marcel Lefebvre for founding a society of priests to act as a remedy to the “confusion and more confusion added to even more confusion” created by the ongoing 50+ years of inaction by post-conciliar popes. The SSPX does nothing but transmit the same Catholic Faith taught clearly and unapologetically until the Vatican II era. Yet to Mr. Voris, priests teaching the true Catholic Faith in a state of ecclesiastical anarchy is “schismatic.” Instead, the faithful should look to Mr. Voris to perform the functions of the papacy until the pope decides to take back over. Thus, Mr. Voris goes further than the SSPX by setting himself up as his own church, something Archbishop Lefebvre was careful not to do. No, the reason that there are no condemnations forthcoming from Rome is not because those in Rome are afraid of offending anyone, it is because they either approve of or are in favor of tolerating as legitimate opinion, “the bogus visions of Medjugorje,” “the mad ramblings of dissidents in seminaries and Catholic universities,” “teachers of the Faith feeling they are allowed to teach their own personal opinions,” and “bishops and cardinals…preaching their heresies.” In short, the former inmates under Pius XII are now running the asylum. So in the end, I ask you which approach is more consistent and more Catholic? Recognizing a crisis of authority in the Church bringing about a state of necessity and taking measures to preserve the Traditional priesthood, sacraments, and Faith? 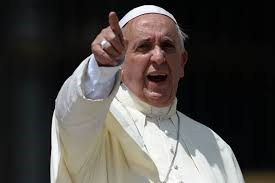 Or recognizing a crisis of authority in the Church and setting oneself up as interim Pontiff to make clear for Catholics who are “schismatics” and “dissidents” and which Marian apparitions are “bogus?” You decide.